The 371 is rare, if not unique, in having four different vehicle types scheduled on it. Many routes have a wide variety of types to be seen, but usually there are only one or two types contractually, and the mixture is just a result of pooling buses across garage allocations instead of keeping them on the correct routes. The main allocation for the 371 is Enviro200Darts, some of which are hybrids. There has also been one double deck running since the start of the contract, which is an SP class Scania, and a second running was added later and should be a Trident. The standard E200Darts are represented by DE25 (YX09 HJO) on the stand at Richmond Sainsbury's on 10 October 2011. Whether this location is really Richmond is debateable, as it is right next to North Sheen railway station! 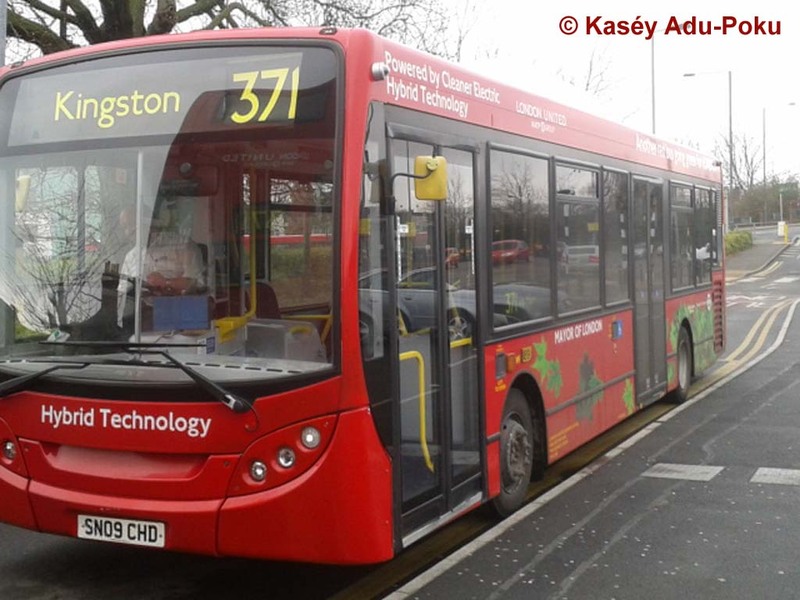 The 371 had previously terminated in Dee Road nearby, but there had been proposals to extend the route to Sainsbury's, partly to stop residents in Dee Road complaining about noise. However it took a number of years before Sainsbury's made the necessary changes to the car park to accommodate the bus stand, which finally opened in April 2011 – and even now the work is not finished, as the lane is too narrow for buses to pass, causing an operational headache. The hybrid version of the E200Dart is represented by HDE2 (SN09 CHD) again at Sainsbury's. Manor Road can be seen in the background sloping up to the junction with Lower Mortlake Road, which sits above the North London Line tracks. 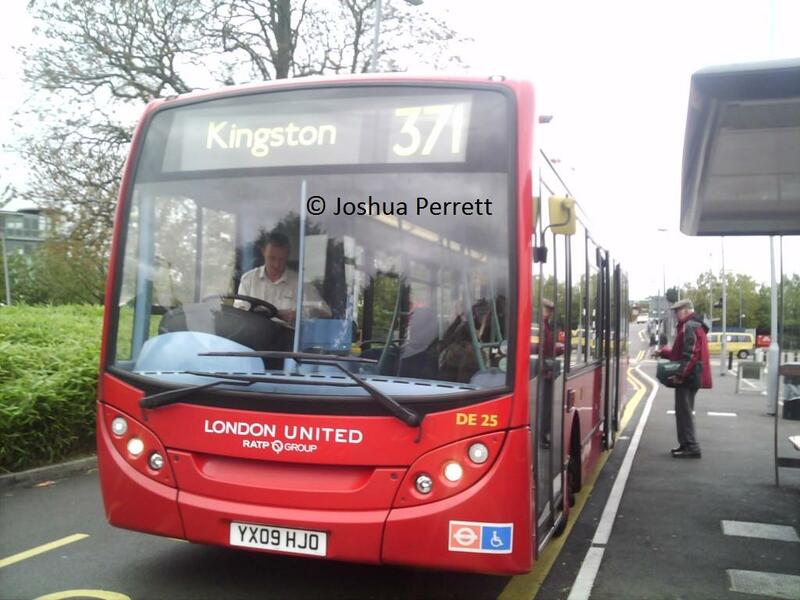 Although the bus is actually facing towards Kingston at this point, it will first double back on itself along this road (B353), then proceed through Richmond town centre before eventually reaching a point about half a mile further south on the B353! Early hybrids carried this green leaf livery and prominent branding. As hybrids became more common this was dropped in favour of discreet branding on standard red. The HDEs, in line with other single deck hybrids, have a huge pod on the roof to accommodate the battery pack. This actually makes them too high to run on some routes! The 371 passes over Richmond Hill, which was initially thought to be a good test bed for hybrid buses, and also resulted in a brief trial of some prototype battery-power Scania vehicles a few years ago. As mentioned, one Trident is scheduled, although in fact this appears to be running on the working that is scheduled for an SP. The reason for the double deck journeys is to serve Greycourt School in Ham, which is served only by the 371. TA345 (SN03 LFS) has presumably reached Ham ahead of schedule and is waiting on the bus stand in Dukes Avenue for its correct time before proceeding to the school and on to Richmond. This used to be a self-contained contract, but the bus has been integrated into the main 371 schedule partly to allow for the extra time needed to extend the route to Sainsbury's, and thus runs a number of trips during the day. Not long after the contract started, in 2009, a need was identified for additional capacity to Greycourt School from the Kingston direction. Instead of providing a double deck short working as with the Richmond flow, an existing trip passing the school at the appropriate time was converted to double deck. Rather conveniently, only a minor re-jig of the bus workings was needed for both the morning and afternoon journeys to be run with the same bus. This is where the Tridents come in, as route 467 had been lost to Quality Line; one if its buses transferred to the 371, displacing a DE to route 698 which gained an extra journey (the other TA from the 467 transferred to the 697, which also gained an extra journey at the same time). Demonstrating the fact that double deckers now work over the entire route, SP102 (YT59 SHJ) at Richmond displays the Kingston destination. 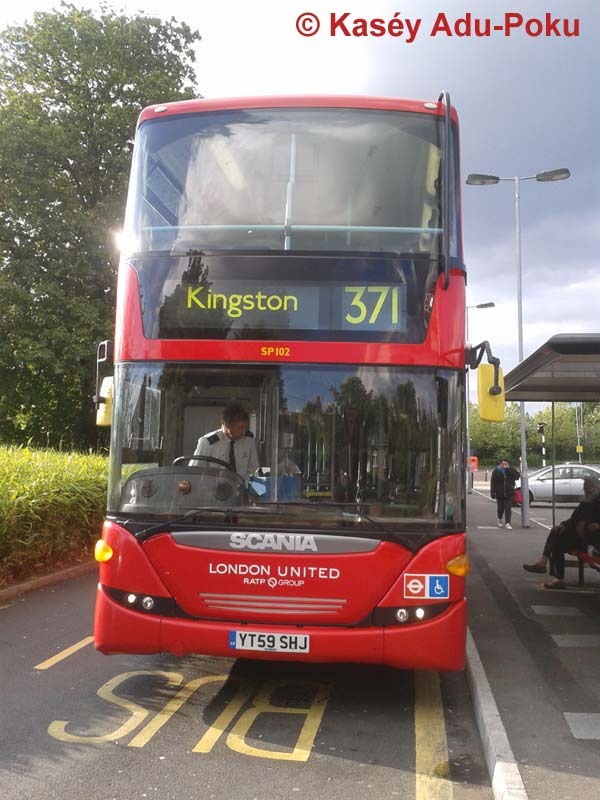 Double deckers are by no means new to the roads served by the 371; as the number suggests, it is a localisation of the former northern end of the 71, which was curtailed to Kingston in 1990. Re-introduction inevitably involved some tree-pruning! Nonetheless residents have kicked up a fuss and as a result all unscheduled double deck workings have been banned for the time being. Initially the 371 was operated by Westlink using DWL class Dennis Darts from Kingston garage. Some of these were replaced by unusual MAN/Optare Vecta buses in 1995 – some of these survived until last year as training vehicles. The rest of the DWLs were replaced by Optare Excels in 1997, resulting in a mixture of low and high floor operation. Operation was transferred to Tolworth garage when Kingston closed in 2001. Contract renewal in 2002 called for new buses in the shape of Dennis Dart SLFs, which remained on the route until contract renewal again in 2009, when the buses listed above were introduced. 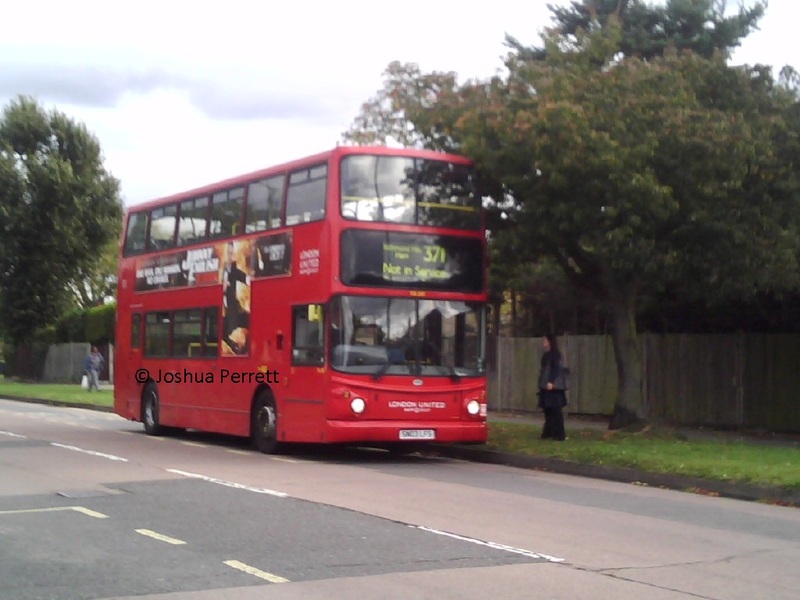 In the interim, though, in 2007, a temporary lease on some of the land at Tolworth expired and the 371 was one of the routes that moved out, to Fulwell garage (which already operated the double deck school trips). This is quite a handy base operationally as buses (and drivers) can get to either end of the route equally easily.